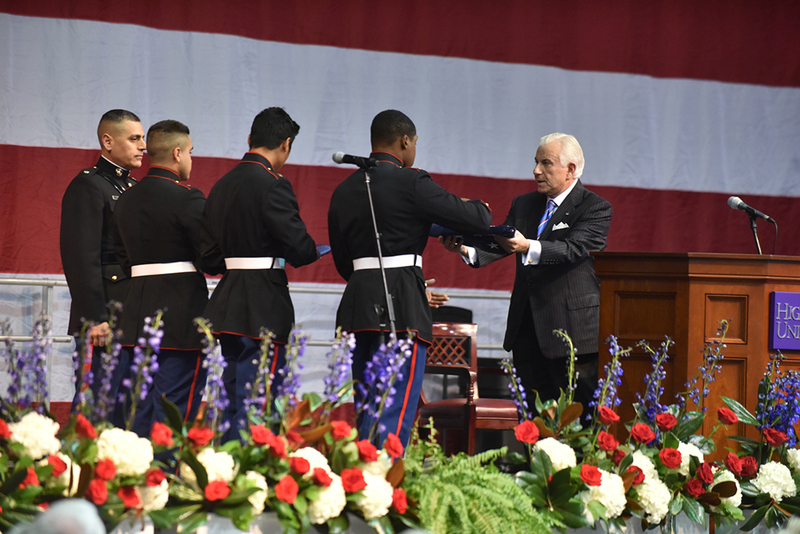 HIGH POINT, N.C., Nov. 10, 2017 – Nearly 1,100 veterans and community members gathered on the campus of High Point University this morning for a celebration honoring the men and women who have served their country. 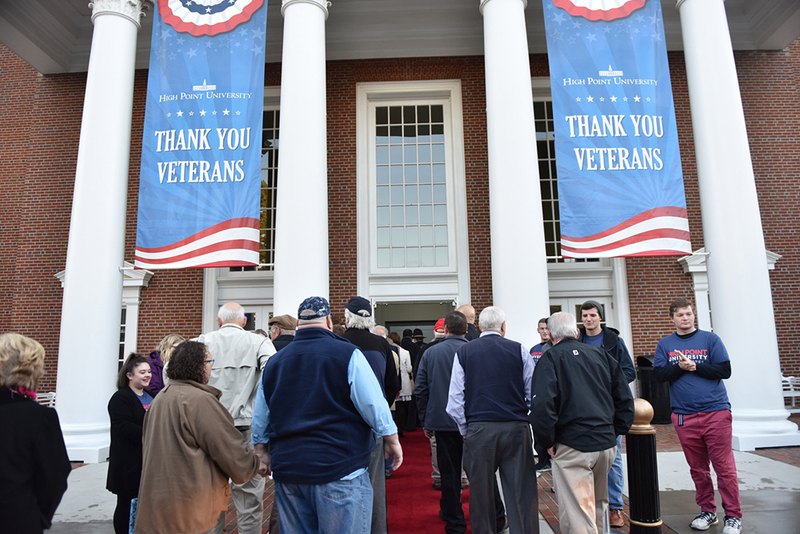 Veterans were welcomed to the James H. And Jesse E. Millis Athletic and Convocation Center with a red carpet entrance and the cheers of HPU student volunteers who lined both sides of the walkway. 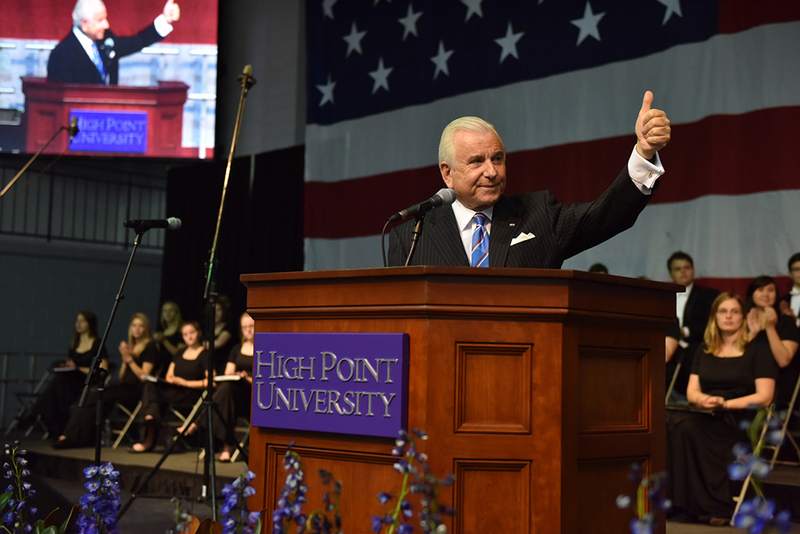 HPU President Dr. Nido Qubein and Col. J. Quincy Collins Jr., a Cold War veteran and Vietnam prisoner of war, were featured speakers at the event, which included a complimentary breakfast and a lineup of musical performances. 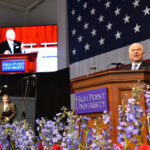 As part of the ceremony, HPU donated 100 American flags to local organizations, including public schools, government buildings and parks and recreation. Collins, a native of Concord, North Carolina, had an illustrious Air Force Career, from opening the new Air Force Academy in 1955 as an air training officer, serving as aide to the Four Star Commander-in-Chief of the U.S. Air Force in Europe, and being shot down by opposition and spending 7½ years in prison cells in and around Hanoi. “Today I want us to transgress from this magnificent occasion here at this university and go back in time to another era, another crisis, another opportunity,” said Collins. “December the 7th, 1945 is a day that lives in infamy. “America, do you remember? We could see the news reels in the theaters, showing the devastation of war in places we’d never heard of; Anzio, the Bulge, islands in the Pacific that sounded like fiction. And then, D-Day. The telegrams started coming. 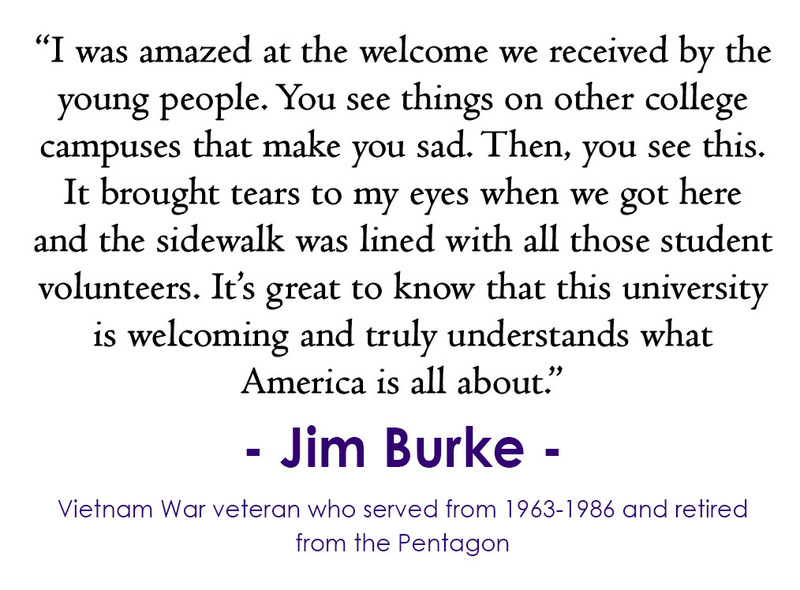 ‘We regret to inform you…’ The pain of war began to spread and become a part of life. Remember that? We must. Karen Jacobsen, global artist in residence at HPU, performed an arrangement of “America, the Beautiful” with the HPU Chamber Singers. Jacobsen is internationally recognized for her voiceover work and musical performances. Known as “GPS Girl,” her voice has been featured in text-to-speech systems in more than 400 million GPS and smartphone devices worldwide, including the female Australian voice of the original Siri application featured on Apple iPhones, iPods and iPads. 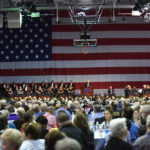 The North Carolina Brass Band also performed throughout the event, including a performance of the Armed Forces Salute, during which each military branch stood for the playing of their service song. Jim Burke and his wife, Sharon, moved to High Point six months ago and attended today’s celebration for the first time. Alex Pinto, an HPU senior, took part in the morning’s celebration. She was drawn to volunteer because of her personal connection to Veterans Day. 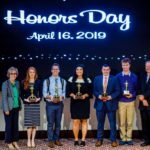 Three groups of HPU students, each of which has dedicated their efforts and raised thousands of dollars for veterans, were recognized during the celebration. 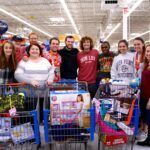 They included representatives from two student-run organizations, The Bed Brigade and United Apparel, and a member of Kappa Alpha, a fraternity that raised $26,000 for the Independence Fund to purchase a track chair for a wounded veteran in the spring. 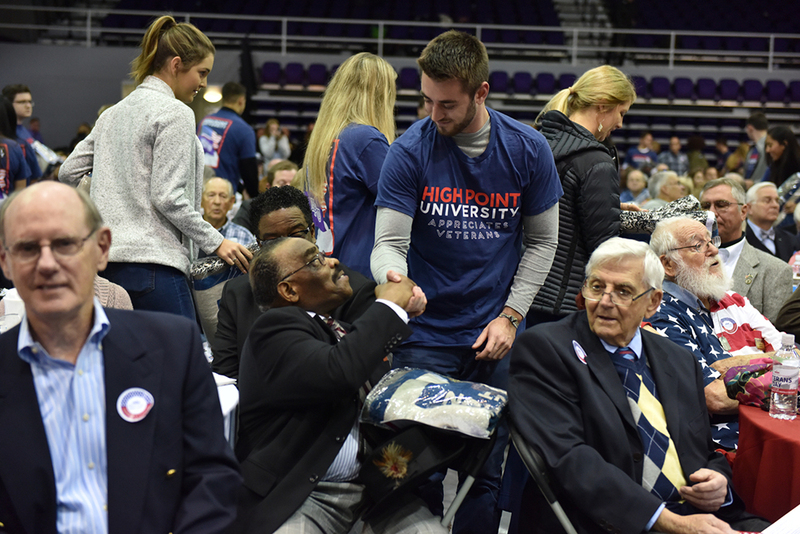 As a special surprise at the conclusion of the event, every veteran received a blanket that was presented to them by one of the hundreds of HPU student volunteers. The blanket symbolizes the warmth and comfort veterans have brought to the lives of others. 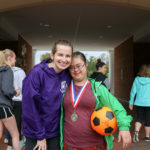 The annual celebration, which has grown significantly over the years, was supported by several local corporate sponsors – River Landing at Sandy Ridge, Ilderton Dodge Chrysler Jeep Ram, and Merrill Lynch/The Tilley Group/Tilley-Higgins Donor Advised Fund. 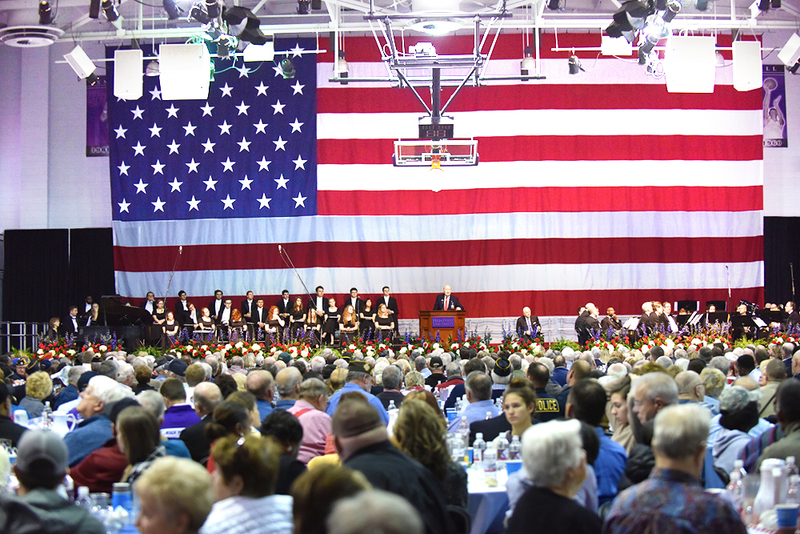 To view more photos of HPU’s Veterans Day Celebration, click here.